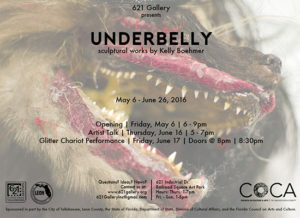 Department of Art | 621 Gallery Happy Hour and Artist Talks: "Underbelly", "Welcome Mat", and "its all in your head"
Home » News » 621 Gallery Happy Hour and Artist Talks: "Underbelly", "Welcome Mat", and "its all in your head"
621 Gallery Happy Hour and Artist Talks: "Underbelly", "Welcome Mat", and "its all in your head"
For the month of June, 621 Gallery will be exhibiting “Underbelly” featuring works by Kelly Boehmer who calls on Shakespeare, Baroque sculptures, cartoons, and beer labels to tell personal stories with a tragic sense of humor through sculpture and installation. 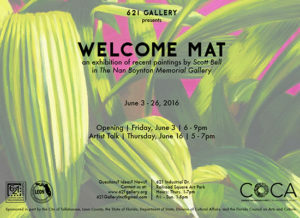 The Nan Boynton Gallery will be exhibiting “Welcome Mat” by recent FSU MFA grad ’16 Scott Bell exploring the notion of domestic and natural world ideals through painting and assemblage. 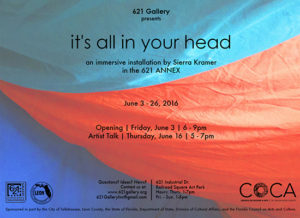 The 621ANNEX will be presenting current FSU MFA candidate ’17 Sierra Kramer’s “it’s all in your head”, an installation-based piece reminiscent of nostalgic blanket-forts delving into childhood imagination.